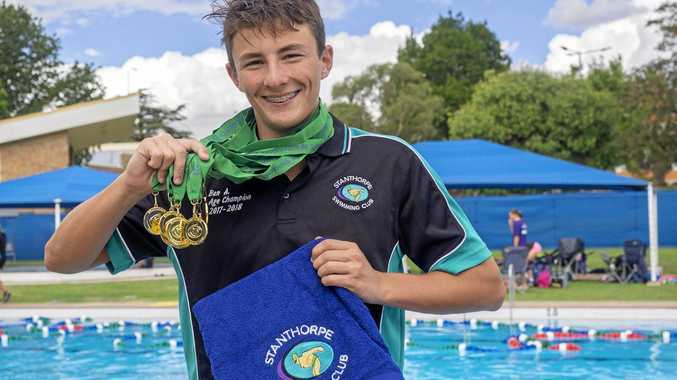 Swimming: Thirty-nine Stanthorpe Swimmers contested the annual Stanthorpe Open on Sunday, with fantastic results by our team. Twenty-two clubs participated and over 230 swimmers and their families were at the pool, it was a very lively atmosphere that produced great racing. Stanthorpe swimmers also topped the points table for the day, in convincing fashion. 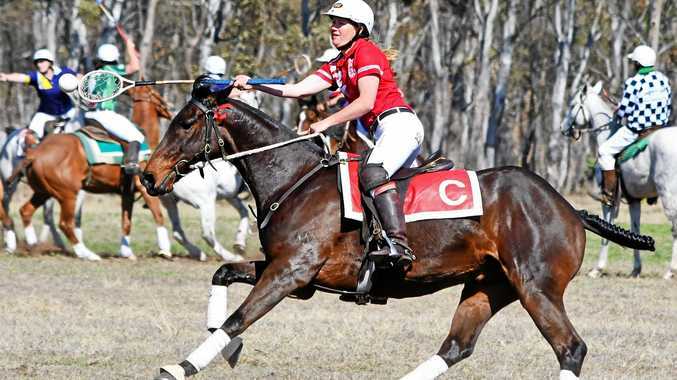 Stanthorpe secured two age champions, Ben Armbruster 15 and Over Boys and Aliesha Rogers 13years girls. Forty-six medals were achieved by our swimmers. Ben Armbruster swam in 10 individual events, picking up 10 golds. Levi Fittock earned three silver medals in the eight years boys 50m Fly, Back and Breaststroke. Isaac Kay picked up two silver and a bronze, whilst William Kay took home four silver and a bronze. Tom Telfer won a silver medal in the eight years Boys 50m Breaststroke, and Brianna Anderson took home a bronze in the eight years 50m Butterfly. Isabella Jackson placed second in the 7&U 25m Butterfly and third in the 25m Freestyle. Katie-Lee Jansink received a bronze for the 11 years girls 50m Breaststroke, and Isabel Kay won gold in the 14years 50m Breaststroke. Hannah McMeniman won silver in the girls 15 years 200m freestyle and bronze in the 50m freestyle. Brooke O'Brien did a fantastic PB to gain a silver in the 100m butterfly for 13years & Over, and Ella Wishart took home a silver in the 16 years 50m Backstroke and three bronze for the 100m backstroke, 200m IM and 50m Butterfly in her age group. Elly Petrie took home a bronze in the girls 50m freestyle, whilst sister Zoewas awarded two bronze medals for the girls eight years 50m Freestyle and Backstroke. Jessica Pradella swam in the nine years girls and took home a gold in the 50m butterfly, silver in the 50m backstroke and bronze in the 50m freestyle. Aliesha Rogers won two gold medals in the girls 13years 50m freestyle and backstroke, and a bronze in the 50m breaststroke. Natalie Rogers swam in freestyle, backstroke and breaststroke, winning three silver medals. Ashley Jackson did a 6.63s PB for her 50m freestyle in the nine years girls. Lillian Kendall also did two PBs with her best being the 50m freestyle where she took off 4.81s. Sasha Kendall also did two PBs, with her best being a 12.33s drop in her 50m freestyle. Emily Linton swam at one of her first carnivals took a whopping 12.75s off her 50m backstroke time. Ella McGlashan did 3 PB's, the best being 7.51s off her 100m freestyle time. Sisters Victoria, Emma and Harriet Morison came away with 4 PB's, with Emma taking off 8.49s in her 200m Freestyle, and Harriet taking 7.19s off her 100m Breaststroke. Victoria also did two PB's with her best being 3.19s off her 50m breaststroke. Tahlia Neal did 4 PB's in her swims, taking off 6.41s in her 50m butterfly, and Emma Pradella did 2 PB's with her best in the 7&U 25 breaststroke with a drop of 5.65s. Georgia Reimers did 3 PB's, with her best being a 4.28s drop in her 50m Butterfly. Taj Cusack set two new PB's with a 6.88s drop in his 100m breaststroke. Brother Xavier also did two PB's with a new time in the 200m freestyle that was 1.45s quicker than his previous swims. Stephen Engelen came away with three new PB's, the best being in the 50m freestyle, where he took off 5.63s. Jacob Hennoste set three new PB's, the best being a 10.33s drop in his 100m Freestyle time. Jordan Pradella swam in the mixed 7&U and set three new PB's, with a 7.53s improvement in his 25m Breaststroke, and Thomas Reimers also did three new PB's, with his best a 3.79 drop in the 50m Breaststroke. Noah Taylor set a new PB in the 50m Freestyle, taking off 1.65s. Liam Telfer also did three new PB's, taking 3.06s off the 50m Backstroke. Brae Willman set two new PB's with his best being in the 3.84s off his 100m Freestyle. A huge thankyou to Netpro, Brass Monkey Brewery, Ridgemill Estate, Golden Grove Wines, Ravenscroft Winery, Sam's Fruit Shop, Ashbern Farms and Smail's Swim School for the amazing support of our carnival. Stanthorpe swimmers will now prepare for the Qld State Sprints to be held at the Chandler Aquatic Centre in Brisbane on February 16-17.